PocketSmith's shared access feature - known as Advisor Access - is perfect if you're a financial advisor with permission from clients to access and manage their PocketSmith account. Advisor access gives you shared access without clients having to share their login details. Your client can invite you to share access to their PocketSmith account so that you can both manage and perform actions on the one account whilst having separate logins. As an advisor, you will have full permissions and can do all the same account tasks that your client is able to do. In order to enable Advisor Access, an invitation needs to be sent from the account of the user (the client) to you. Both parties will need to have a PocketSmith account in order for Advisor Access to work. You will receive the invitation via email, asking if you would like to accept or decline Advisor Access. Once accepted, you will need to sign in to your own PocketSmith account, where you will now have access to your client's account from your account profile (in the top right corner) under Manage Clients. Your client will be able to see a list of the times you have accessed their account. You can create a free account in order to accept Advisor Access on a clients' account, with no need to add any bank accounts or data to that free account. It's not currently possible for someone with Advisor Access to manage another user's account via the mobile app. You will need to use the Web app in order to make use of this feature. Here are the steps designed for your client to invite you (the Advisor) to have Advisor Access on their account. Share these with your client to help them get set up! 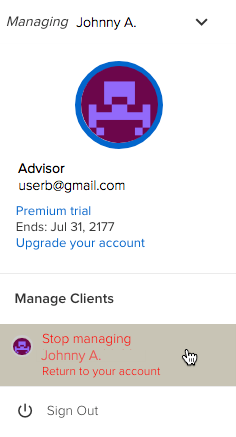 The advisor will now have access to your account. They just need to log in to their account and head to Settings > Account control > A ccount access and click Manage beside your email address. 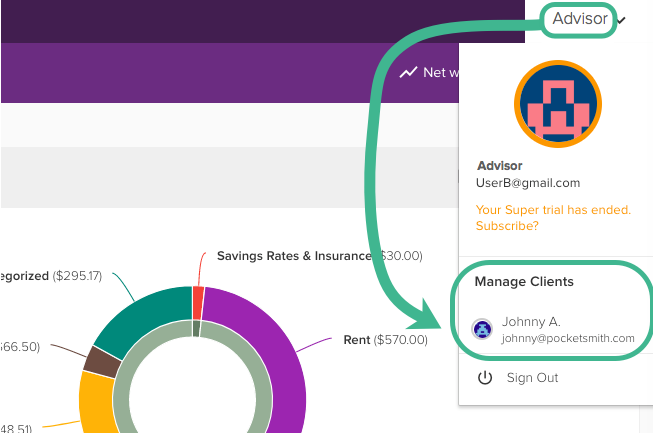 When the advisor is managing your account, the profile name will change to Managing Johnny A [username]. They can return to their own account by selecting Stop managing - return to your account from the Profile menu. Your client should also be shown how they can revoke your access if necessary.